Dornbirn [ˈdɔʁnbɪʁn] is a city in the Austrian state of Vorarlberg. It is the administrative centre for the district of Dornbirn, which also includes the town of Hohenems, and the market town Lustenau. Dornbirn is the largest city in Vorarlberg and the tenth largest in Austria. It is an important commercial and shopping centre. Dornbirn is located in western Vorarlberg at 437 metres above sea level in the Alpine Rhine Valley, at the foot of the Karren mountain, part of the Bregenz Forest Mountain chain at the edge of the Eastern Alps. It is near the borders to Switzerland, Germany and Liechtenstein. The Dornbirner Ach river flows through the town and later into Lake Constance. Dornbirn once consisted only of 4 "quarters": Markt, Hatlerdorf, Oberdorf and Haselstauden. By the 20th century Dornbirn had annexed two formerly independent communities to the west: Rohrbach and Schoren, thus bringing the total number of districts to 6. The Town of Dornbirn constitutes almost 70% of the surface of the district Dornbirn and has numerous borders to other municipalities. 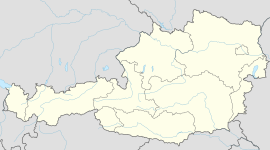 As well as bordering on the two other municipalities in the Dornbirn district (Hohenems and Lustenau), the town shares borders with 15 municipalities of the Bregenz District: (Lauterach, Wolfurt, Schwarzach, Bildstein, Alberschwende, Schwarzenberg, Reuthe, Mellau, Damüls) and four with the Feldkirch District: (Laterns, Zwischenwasser, Viktorsberg, Fraxern). The earliest evidence of human presence in the Dornbirn area can be dated from the Mesolithic era. The name "Dornbirn" derives from 'torrin puirron', meaning the 'Settlement of Torro' (the name of an Alemannic farmer living there) and thus has nothing to do with "pears" (German "Birnen"), although this fruit is prominently portrayed on the town emblem. This name is mentioned for the first time in 895, in a document from St. Gallen (Switzerland). Dornbirn became part of the Habsburg Monarchy in 1380. In 1793 it was elevated to a market community. It was not given municipal status until 1901. In 1932 the mountain village of Ebnit was annexed. In 1969 Dornbirn became the seat of the new Dornbirn district administrative authority. The current mayor (since 2013) is Andrea Kaufmann (ÖVP). The Messestadion is an indoor sporting arena located in Dornbirn, and home to the local ice hockey team. Vorarlberg's regional studio of the ORF (Austrian Broadcasting Corporation) is located in Dornbirn. Zumtobel Lighting Group is an ATX traded company based in Dornbirn. Many other large companies are situated there. The town was formerly a major centre of the textile industry, which has been in decline since the 1980s. Located in the middle of the Rhine valley, Dornbirn is an important junction of regional and interregional bus lines, connecting Bregenz to the north, Feldkirch to the south, and the Bregenz Forest to the east. The A14 Rheintal freeway/motorway (Autobahn) passes by to the west. The Achrain tunnel, opened in 2009, directly connects Dornbirn/Haselstauden with the Bregenz Forest - Alberschwende region. The town has an excellent network of municipal buses. Dornbirn's railway station connects is an important stop for all trains from west to east Austria. A small airport is located at nearby Hohenems. Educational institutions in Dornbirn include the Vorarlberg University of Applied Sciences, two General Education Secondary Schools, and a Higher Technical Vocational College (Höhere Technische Lehranstalt). The Vorarlberg University of Applied Sciences (German: Fachhochschule Vorarlberg) was originally founded as technical school in 1989. It achieved status of an officially recognized university in 1999. To date, it is the only institution of higher education in Vorarlberg. It currently offers Bachelor's and Master's degrees in the fields of Business, Engineering & Technology, Design and Social Work. About 1350 students have enrolled for the term 2018/19. One of the most important sportive institutions in Dornbirn is the RHC Dornbirn, one of the most powerful Austrian Rink Hockey teams. In 2010 it hosted the 2010 Rink Hockey Men's B World Championship. Baseball & Softball Club Dornbirn was founded in 1990, and has won the Austrian title twice. BSC Dornbirn consists of one youth team, two men's teams, and two women's teams. Dornbirn hosted the World Gymnaestrada event in 2007 and will do so again in 2019. ^ "FH Vorarlberg – University of Applied Sciences". www.fhv.at. Retrieved 2019-02-07. Wikimedia Commons has media related to Dornbirn. Wikisource has the text of the 1911 Encyclopædia Britannica article Dornbirn. Wikivoyage has a travel guide for Dornbirn.